What’s Up With Your Elevator Speech? Since getting out there and meeting the masses is important to generating new business, having an effective elevator speech (or pitch) is a marketing tool that every lawyer needs. It communicates to prospective clients, who you are, what you firm does, and how your clients benefit from your services. An elevator speech should be eight to ten sentences, about eighty words or so, and short in length, about 30 seconds. There are many ways to write an elevator speech; I’ve broken it into five parts. An elevator speech is something that you’re going to have to experiment with and practice giving. So play around with this format and see what works for you. You should also consider whether you are going to need more than one elevator speech dependent upon what services you are marketing, and who you’re marketing to. You should start with a hook. A statement that will draw your listener in, and get them curious about what you have to say next. It should be conversational but pique their interest, so that your audience asks for more information. Say something brief about yourself, your firm, and what you specialize in. Discuss what you have to offer and why they should you use use you. Give an example of the services you provide. Tell your listener how you or your firm is different from other firms out there; and why the services you offer are unique. At the end of your pitch, you should have a call to action. Don’t try to close a deal. It’s not time for that. Your objective should be to build a relationship with the individual(s), grow your network, and increase your client base. Instead, ask your listener: if they would like to schedule an appointment; be on your email list; connect through LinkedIn; have a lunch together; or whatever else is appropriate. Just follow up and follow through. Writing your elevator speech down is the easy part, memorizing it and putting it into practice is another. There is really only one way to get good at your elevator speech. That is to practice, practice, practice. Believe me, I’ve tried all the other ways to get good at my elevator speech WITHOUT practicing and they just don’t work. So save yourself the time. You need to say it aloud over and over again. One of the reasons you need to say it to yourself is, you need that auditory feedback, you need to hear it for yourself. Chances are, after you’ve heard it, it’ll sound a little stupid; you’ll have to go back and change it. Only with practicing out loud will it sound natural and conversational. So in the car, in front of the mirror, to the dog, don’t forget your spouse and kids, and of course to yourself as a recording in your phone. Finally, be a good listener! Your audience may interrupt you with a question or comment. This is good. 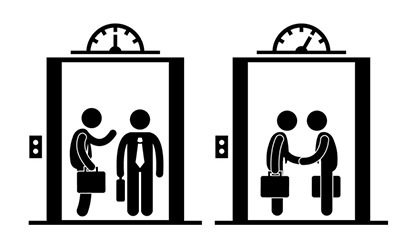 If this happens, you know you have an effective elevator speech. Answer their question, and suggest a call for action. Don’t plow through to the end of your pitch, there may not be a need, and your pitch may have already done its job. The important thing is to be conversational and natural. Creating an elevator speech should be fun and challenging. I hope to hear your elevator speech soon. Paul Miller is a sole practitioner located in Denver whose primary focus is estate and business planning. He can be contacted at paul@pmillerlawoffice.com. I’ve been working on something like this for myself. I like your formula because I think it will help me refine my message. I agree that you probably need more than one speech unless your area of practice is highly specialized. Great article! Thanks for your comments Jessica! I like your detailed outlined but I’m struggling with the “hook” you reference. My experience has been more along the lines of responding to “oh, you’re an attorney … so what kind of law do you practice?” It may well be that I’ve been doing this whole thing wrong from start to finish but I’m not seeing how the hook comes in in the above situation. Is it possible to get an example of what you mean? Hi Rob, I forwarded your question to Paul, the post’s author. He will email you directly about your question. Thanks for reading!